A picture paints a thousand words – and this one is every farmer’s worst nightmare! 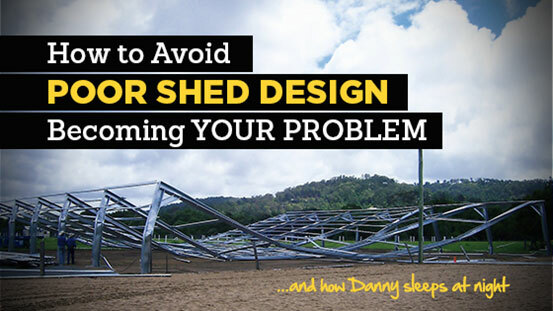 Danny Halupka owner, Grant Sheds shares how you can avoid this shed nightmare from becoming your reality…plus some good news for NEW shed owners. I just had a chat with our Engineer regarding some specific engineering we required, and a few points came out of the conversation that I thought would be worthwhile passing on to you. The first point that we discussed was a new engineering program that we will soon be using that will give us the ability to site specific engineer every shed based around the exact design of your shed. This will be extremely important in coming times as councils are getting harder and harder on manufacturers to provide exact details for each and every shed. The building codes are forever changing and we need to keep up with the latest changes so that council approval will not be a problem. This new program will allow us to have the sheds independently certified prior to council application. “What does this mean?” I hear you ask. Well it means that an independent, separate engineer (other than the one who designed the shed) has checked the design against the current building code and will “Certify” that it does in fact meet those very stringent criteria. This cuts out another step in the Council Building Application process and speeds things up dramatically. Without this independent certification, the council will need to send it off to their own engineer to do the exact same thing. This can sometimes take up to an additional 5-6 weeks, wasting time for everyone. When it’s specifically designed to the shed layout you need, we will be able to engineer it with the best possible combination of materials for the job and it will more than likely be even more cost effective yet still retain its “Grant Sheds” STRENGTH that we are so well known for. Another thing that came out of the conversation was that when engineers design a building, they can in fact design it with quite light footing bolts. The interesting part was that they had only used 4 x 20mm footing bolts per footing. 20mm! That’s tiny!! Just imagine all that weight going down on those poor little bolts and the sideways strain when setting the shed up must be enormous. I have seen them bend like “bendy straws”. In situations like that, if they are not treated VERY carefully during construction, disaster is written all over it. Yes that might be the case during construction but once it is handed over, it could become your problem should the shed move between the completion of the erecting and the putting in of the floor, if you’re installing a concrete floor that is. I have seen footing bolts sheer clean off! I have seen footing bolts sheer clean off if there is any residual movement in the structure, leaving the column flapping around like a flag in the breeze. I like to sleep at night knowing that I have done everything in my power to know that the shed will be still standing in 50 years time just as it is standing when first erected. 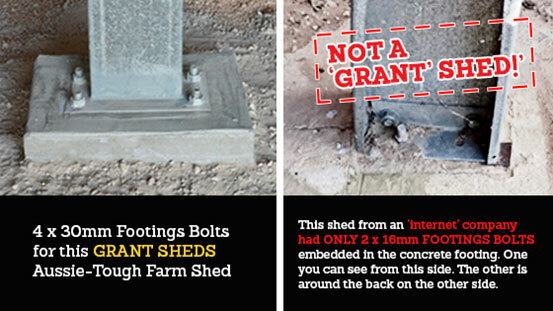 If we’d supplied this building, we would have used 4 x 30mm bolts on each footing. That’s SUPER STRONG and it’s one of the reasons why we can offer a 50 year guarantee and other’s don’t. I see this sort of thing all over the place and just have to shake my head sometimes and wonder how this other brand’s shed managed to be erected, let alone to stay up. Another instance I can relate to was a shed that was supplied by an “internet” shed supply company which is using a bracket style construction (photo below right). It was a 15m span x 45m long and 5m high in 9m bays. That’s quite a big shed. Now this one only had 2 x 16mm footing bolts per footing. Count them – Just 2! On top of that, they were bolted down with a very light angle iron bracket, which was only about 5mm thick. I don’t know how they manage to sleep at night. The farmer’s who bought this shed were none too happy either. It makes sense to invest in a farm shed that’ll do the job properly … one you can rely on to do everything you need. A farm shed back by a Rock Solid 50 Year Structural Guarantee. Click Here to get your no-obligation FREE report, “The Farmer’s Guide To Choosing The Best Farm Shed For Your Rural Property” (valued at $97). It reveals the big difference between a farm shed made “on the cheap” and one that’s really suited to your needs. It includes The 7 Big Costly Mistakes Shed Buyers Make … And How To Avoid Them! 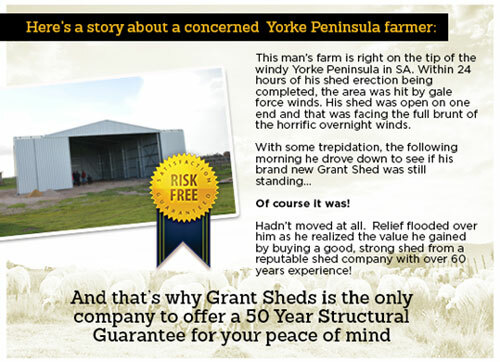 – A must read for any farmer serious about strong, great value sheds.